The Stamford Plaza Hotel Melbourne is both - a comfortable 5 star hotel, and one of the most luxurious boutique hotels in Melbourne. At the Stamford Plaza you dont get just a room, but a suite - a comfortable and stylish home away from home. You have the choice between one or two bedroom suites, or a penthouse suite, each with spacious dining and living areas, and well equipped kitchen, including pantry service to stock up with food. Each has a separate dressing room, luxurious marble bathroom with spa, and separate bathrooms for the 2 & 3 bedroom units. The 283 room hotel is stylishly decorated. Its covered rooftop pool gives you city views. Theres also a modern fitness centre with floor-to-ceiling windows. It has a classy restaurants, conference and function facilities. For secure bookings and guaranteed best prices, you can book the Stamford Paza Melbourne here - No Reservation Fees! 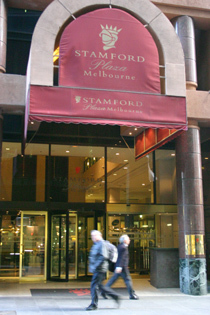 The Stamford Plaza Hotel Melbourne is ideally located at the Paris end of Little Collins Street, right in the heart of Melbournes culture. Nearby, you will find stylish restaurants and bars, high end boutiques, and the iconic Melbourne theatres and galleries. It is also walking distance to the city's famous sporting arenas. Whats great about the Stamford, is that it can give you a very peaceful and relaxing stay, right in the heart of the city. Service is voted to be friendly and helpful, the food delicious, and the rooms clean and comfortable  what more can you ask.